I'm using TB67S249FTG with a large heatsink and a fast fan so reaching 4.0 amps should be possible. I'm using this motor and this motor. 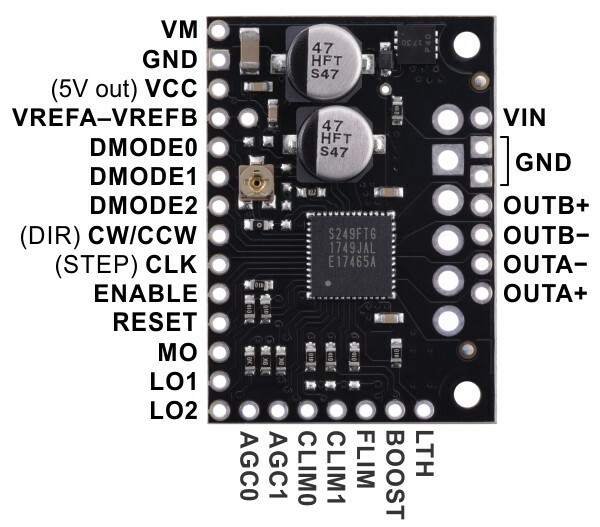 I wanted to find the perfect Vref for it with this driver and possibly go a little over the rated 2.1a per phase but I can find the equation for it. Re: Vref equation for TB67S249FTG? I'm still new and I'm not sure where can I find the Vref? Is it stated at the motor specs or the driver? Please remove the Tech in your pseudo. Edited 2 time(s). Last edit at 03/07/2019 05:53AM by Dust. Sorry man I just use it on every single account I have. It is easier to remember that way. Thank you anyway. Thanks a lot, I have calculated and got 0.78125. Polulu gives an example that calculates out as simply Vref = current limit / 1.25.... the AV term doesn't seem to be in the calculation. So what is that AV term in the equation? That's what I don't get. Also, Roman Tech....how the heck did you get 0.78??? For your example, I get Vref = 2.1A / 1.25 = 1.68.